LADIES OF THE CAT: Camille, Eva, Ashlee and Paula, in a photo from 2012. When The Cat and Fiddle closed down at its Sunset Boulevard location in 2014, it was a sad day for many, especially the Gardner family — mom Paula and daughters Eva, Ashlee and Camille — owners of “The Cat,” as it is affectionately called. Last year, however, the family-owned, family-friendly public house was resurrected after a brief hiatus at 742 N. Highland Ave. in the former home of Highland Grounds. Kim also wanted to “get the party out of our living room,” says Paula (who married Kim after they met on one of his tours). As a musician, Kim had friends who visited from all over the world who frequently ended up in the family’s living room. For Paula, from a Lebanese family in New Orleans, hospitality reigned supreme in their home. She had learned from her own mother that every guest was greeted with a snack and a drink. “You don’t ask if people are hungry. You just put the food out,” she says. For the sake of Kim’s dream (and their living room), Paula closed her store down and threw herself into helping open The Cat. She was eight and a half months pregnant when it opened October 1982 in Laurel Canyon, and it soon became an extension of the Gardner’s living room — popular among many of Kim’s musician and artistic friends. 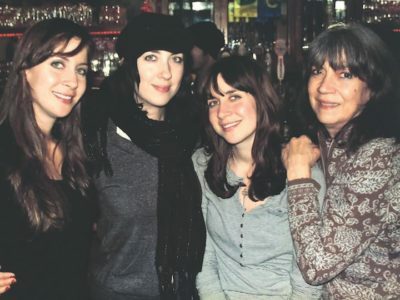 Thirty-six years later, Paula and those twin girls, Ashlee and Camille, join oldest daughter Eva in running their friendly family pub at 742 N. Highland Avenue. And it’s often a party atmosphere at the pub. Last month, the full moon was high in the sky when The Cat and Fiddle had its first “Full Moon Party.” According to Ashlee Gardner, the pub will have more such events. The promise of all-night happy hour specials and a psychic tarot reader on tap added magic and fun to the bustling Friday evening crowd. “The party was all Paula,” said Ashlee, referring to her mom. Friends and I who attended the event reminisced about the restaurant’s former space on Sunset Boulevard and compared it to the new space on Highland. Although The Cat had originally opened in what the owners describe as a “small nook” in Laurel Canyon, the pub, by 1985, had outgrown that space and had moved to Sunset Boulevard, where it continued to be a hot spot for musicians and a neighborhood mainstay until it closed in 2014. Kim Gardner, whose dream it was to open the pub, continued playing bass guitar after The Cat’s 1982 opening, and he also became an accomplished painter, displaying lithographs of his artwork at the restaurant. Kim passed away in 2001 from cancer, but his wish to have a public house, an extension of his home, where people could enjoy good company, continues with the work his wife and their three daughters put into The Cat. By the time the pub had moved to Sunset Boulevard, “the girls” had grown old enough to start school. Mom and daughters alike speak fondly of “the girls” going to school “across the street” at Blessed Sacrament and coming “home” to The Cat, where they did homework and sold school raffle tickets and Christmas ornaments to pub regulars. Longtime waitress Lizzy remembers Eva, Camille and Ashlee following behind her as she took orders, helping to pass out menus and taking their own versions of orders. As the girls grew up, as an integral part of The Cat, they gained an education in people and the restaurant business. Eventually, they grew into jobs at the restaurant, such as helping make salads in the kitchen, greeting customers, waiting tables and bartending. Eva, a bassist like her father, began playing at age 13 and had some of her first gigs at The Cat. Everyone in the family contributes to running the pub. Paula brings an old-school sensibility and practicality to supervising the restaurant. She also likes to make sure she keeps the right tone for what a British public house should be — with a California twist. Ashlee, who has a music management and production company with husband Justin Raisen, is involved in the marketing and the accounting side of The Cat. Justin frequently pitches in, as well. Camille, who started out in kinesiology and nutrition and worked as a physical trainer, eventually made her way back into the restaurant business by way of Sofitel, David Burke Group and Patina. Now she specializes in human resources and training. She and her husband, Ben Camper (director of strategic branding at 24-Hour Fitness), also are consultants for the corporate side of things at The Cat. Many of the employees have been with the restaurant 10 to 25 years. Chef Eduardo Silva started out as a grill cook at The Cat in the ’90s. He eventually began his own catering company and worked under Wolfgang Puck before returning to The Cat. Silva has updated the menu while keeping to the British staples of fish and chips and savory pies. The pub now has mushy peas as a side dish, as well as vegan corn chowder. Currently, every item on the menu, except the French bread, puff pastry and sliced bread, is made at the restaurant. When The Cat reopened in 2017, the family’s lives came eerily full circle. Preceding the opening in June, Ashlee gave birth to son James in April. And then Camille gave birth to son Caden in October. This year, a full year after the reopening, Ashlee gave birth to her daughter June. And so a new generation was born into life at The Cat. In the meantime, old customers — referred to by the family as the “lads” and “lasses” — have found the pub again, but new customers also have discovered the restaurant. “It’s nice to see someone new come in and say, ‘this is a cool vibe’,” says Ashlee. Paula says that they enjoy creatively presenting special events and having musical acts. For St. Patrick’s Day, they installed a tent in the rear parking lot, for example. For the World Cup and the Royal Wedding of Prince Harry and Meghan Markle (“the girls” went to Immaculate Heart at about the same time as Markle), The Cat was open at odd hours so guests could watch live. There also is Pub Quiz Tuesday, put on every week by “Brits in L.A.” Personally, I am looking forward to more Full Moon parties. As Camille notes, The Cat’s brand is evolving. Each woman has her own take on what traditions are being carried forth from Kim’s original dream. “Home and hospitality,” says Paula. “Fun,” says Eva. “Connection,” says Ashlee. wonderful write up on a great family. i remember the canyon Cat and had visited the Sunset Cat. then later in life, my daughters went to high school with the twins, who have become forever family friends. i truly appreciated your very complete story on this loving family.